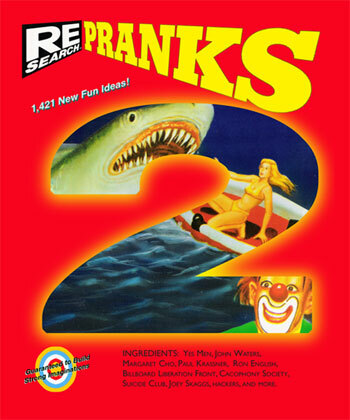 V. Vale’s RE/Search Publications, which has been documenting unique and unusual underground culture for over 26 years, is just about to release “Pranks 2”, the follow-up to their legendary “Pranks” book which was orginally published in 1988. The first Panks book had a huge influence on me and many other people and I’m sure Pranks 2 will have an even bigger effect. The articles and inteviews in Pranks 2 feature Jihad Jerry, Jello Biafra, Al Jourgensen, Bambi Lake, The Yes Men, The Suicide Club, The Cacophony Society, Reverend Al, Julia Solis, Billboard Liberation Front, Marc Powell, Frank Discussion, Paul Krassner, Margaret Cho, John Waters, Ron English, Joey Skaggs, Survival Research Labs, monochrom, Lydia Lunch, Monte Cazazza. What are pranks? For us, pranks are any humorous deeds, propaganda, sound bites, visual bites, performances and creative projects which pierce the veil of illusion and tell “the truth”. Pranks unseriously challenge accepted reality and rigid behavioral codes and speech. Pranks deftly undermine phoniness and hypocrisy. Pranks lampoon sanctimoniousness, self-glorification, selfmythologizing and self-aggrandizement. Pranks force the laziest muscle in the body, the imagination, to be exercised, stretched, and thus transcend its former self.The imagination is what creates the future; that which will be. Pranks 2 is expected to come out in October/November and can be pre-ordered now.